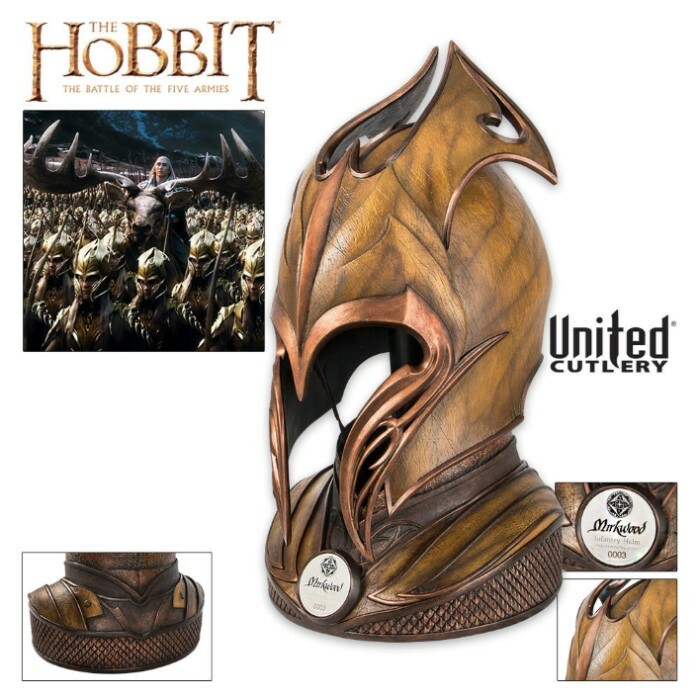 Mirkwood Infantry Helm | BUDK.com - Knives & Swords At The Lowest Prices! The Mirkwood Infantry are soldiers of the Woodland Guard, Silvan Elves sworn to protect and watch over the great forest of Mirkwood. Their armor and weapons are very organic in nature, incoroprating materials and textures from the forest world around them, with designs that are very ornate and Elven, yet functional. the helms and plates of armor were forged from a golden-bronze-like steel adorned with a slgihtly iridescent green-gold colored leather, resembling stained and laquered woods. This authentically detailed replica is a reproduction of the actual filming prop used in the motion picture, THE HOBBIT: THE BATTLE OF THE FIVE ARMIES™, built by Weta Workshop of New Zealand. 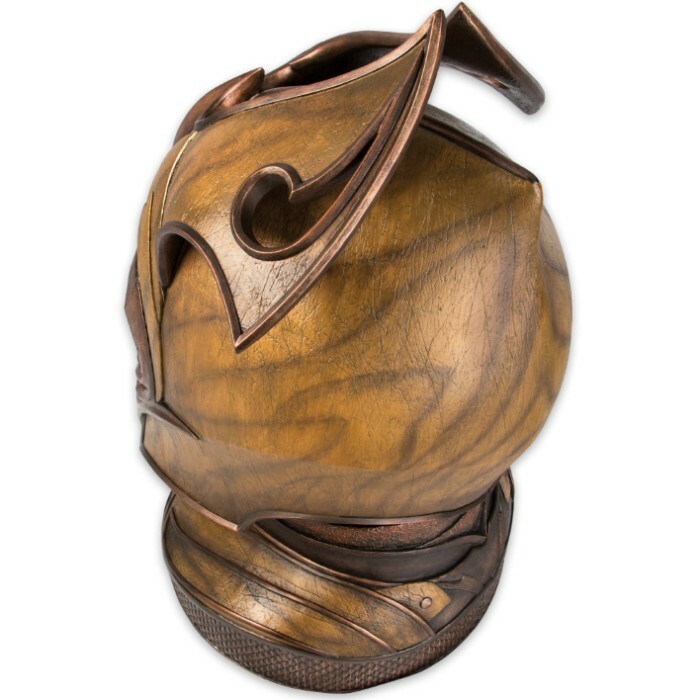 The helm is crafted of reinforced polyresin, with precisely-molded details and coloring, including weathering and aging effects to give it that bronze-like steel quality. 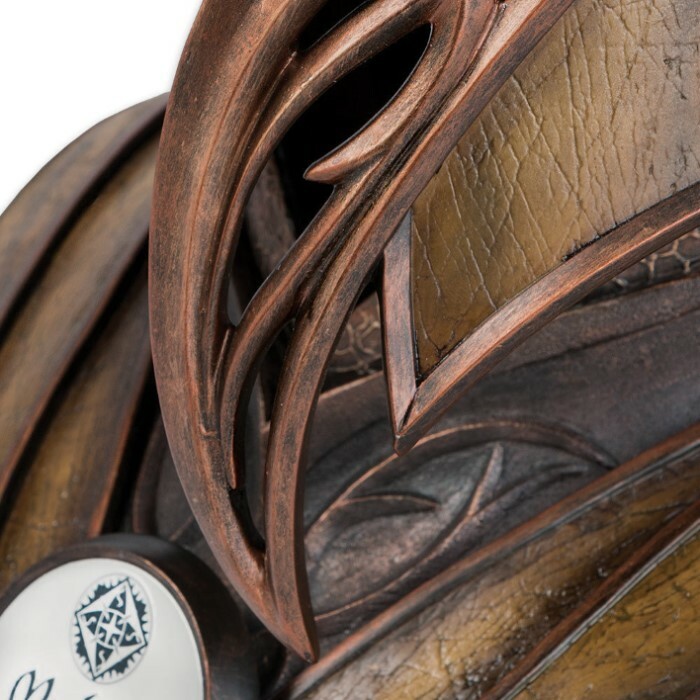 It is presented with a polystone and wood display, sculpted in the shape of the Mirkwood infantry neck and shoulder armor. It includes a certificate of authenticity. This is one of my favorite collection is beatiful budk is 100% the best in swords . Yet another stunning piece from UC in The Hobbit line. I think next to Sauron's helm, this helm is my favorite produced as yet. Great design with amazing detail and it fits well too. Yeah, that's right, I put it on for a minute or so. Love it!